How dumb have we become? That’s the question Far, one-half of the duo known as HDLSS, asks. Together with his bandmate Wolfy, HDLSS produce music so visceral and lush that it can be likened to Jai Paul’s wildly gorgeous leaked demos. They bring us the kind of rare and thorough artistry that could make a cloud cry. Listening makes us realize we walk under stars. “[The music] has an ethereal shoegaze sound to it [as well as a] four-on-the-floor dance beat. There is something with death of genre in this generation…that’s the place I am coming from,” Far told Kajal. Far and Wolfy embed spoken word and interviews (like Toni Morrison’s in “Colonizer”) into thoughtfully layered tracks that register like symphonic melodies. We hear xylophone, slips on guitar cords that sounds like water droplets, birds chirping, and corkscrewed, tapping transitions. 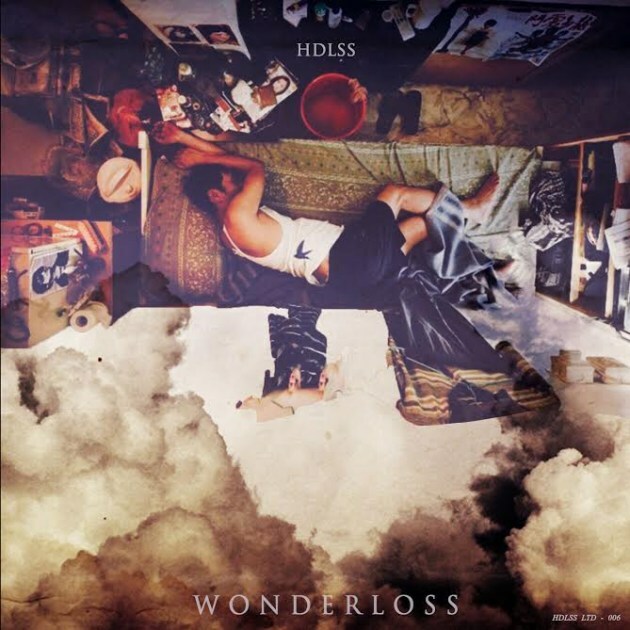 HDLSS’s lyrics embed themselves perfectly into a universe of melody. Our favorite track of theirs is “False Flag.” It opens with vintage “wee-ooh’s” pillowed into Far’s honeyed voice, unfurling like a breath that leaves a fog on the window. This music makes your body sway and gives you bedroom eyes. He subverts uncomfortable truths into a danceable, sensual track. I’m half awake in my third eye. A grave mistake that I normalize. The lyrics grapple with complicity and apathy. They document mental health struggles and disconnections felt as a Muslim in America. They attest to the desensitization to cultural trauma, xenophobia, and the disenfranchisement of minorities. Cover art for the single “Wonderloss.” Far created this image as a representation of what depression looks like. Far’s personal journey is political. And to him, art is inherently political. He takes his craft seriously. Out of 50 songs, Far and Wolfy chose just 14 for the final cut of their recently released Selections from Dumb. The writing is a product of Far’s emotional labor, of experiencing the paralysis of his “dumbing down” from indulgence in technology and self-destruction. Far is bearing witness to his thoughts. He is indicting himself, questioning the agency he has in his life and asking how dumb he has become. Follow HDLSS on Facebook, Twitter, Bandcamp, Spotify and Soundcloud.